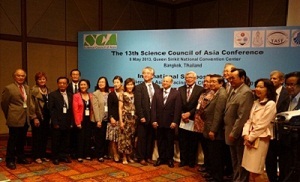 The 13th SCA Conference was held between 7 and 9 May at Grand Centre Point Hotel & Residence-Terminal 21 and Queen Sirikit National Convention Center in Bangkok, Thailand. The conference was attended by thirteen member countries, namely, Bangladesh, Cambodia, China, Indonesia, Japan, Republic of Korea, Malaysia, Mongolia, Myanmar, The Philippines, Sri Lanka, Thailand and Vietnam. On 7 and 8 May, SCA Management Board Meetings were held and operations and future activities of SCA were discussed. The contents of Joint Declaration were considered as well. 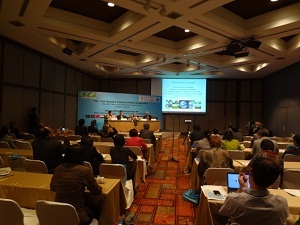 On 7 May, four ongoing research projects between Thailand and Japan were presented in SCA Joint Project Workshop. 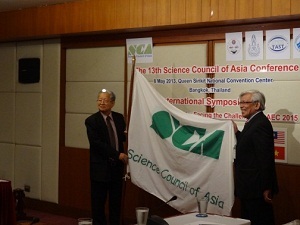 Then, on 8 May, SCA International Symposium was held under the theme of "Role of Science in Asia: Facing the Challenges of AEC 2015". 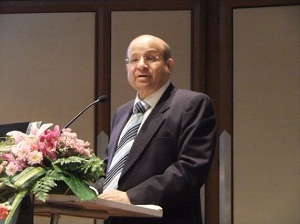 The Symposium began with the keynote speech by Dr. Bindu N. Lohani, Vice President of Asian Development Bank titled "Asia’s Development Challenges: Role of Science and Knowledge". Then it was followed by a series of lectures, presentations, parallel sessions. In Panel Discussion titled "Future Earth", importance of global sustainability was actively discussed. Approximately 120 participants from academia, government and public attended the Symposium.